The 2018 Regal GS, a higher-performance version of the Sportback with a 3.6-litre V-6 and standard all-wheel drive, starts at $47,145. DETROIT -- Canada will get two of three versions of the 2018 Buick Regal, the automaker said Wednesday as it revealed Canadian pricing for the Buick Regal Sportback GS. The GS will join the basic Buick Regal Sportback for sale in Canada. The United States will also get a wagon-body style TourX version of the redesigned vehicle. The Regal Sportback GS will start at $47,145, including destination fees. Pricing for the Regal Sportback will be released closer to the end of summer, the automaker said. The 2018 GS is a higher-performance version of the Sportback with a 3.6-litre V-6 and standard all-wheel drive. 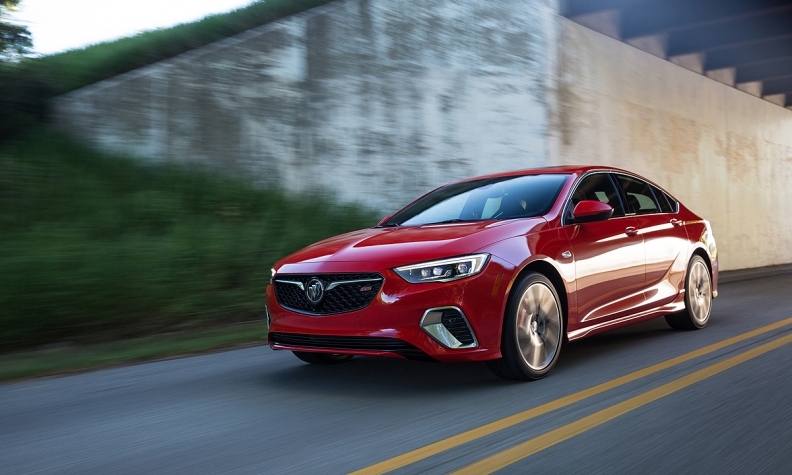 "This is a sport sedan designed for everyday driving, but one that makes every drive special," Duncan Aldred, GM's vice president for Global Buick and GMC, said in a statement. "The new Regal GS is in the sweet spot of the market: more refined and luxurious than the mainstream, more value for the price with style and premium features on par with higher-end competitors." Buick revealed the 2018 Regal GS in Detroit on Wednesday, after showing the Sportback and TourX in April. The redesigned Regal GS will have 310 hp -- 51 more than the outgoing model -- and 282 pounds-feet of torque with direct injection, cylinder deactivation and engine stop-start. Its engine is paired with a nine-speed automatic transmission that soon will be offered on five Buick models. The standard Sportback includes a nine-speed transmission only with front-wheel drive, switching to an eight-speed for awd. The front and rear fascia, side skirts and rear spoiler are unique to the GS, which comes with 19-inch wheels and Brembo front brake calipres. Inside are heated, cooled and massaging front seats, a sport flat-bottom steering wheel and metal pedals.